Welcome to Casa Pacifica.Expect the unexpected in this stunning work of art, inspired by mission-style architecture. The designer of this custom-built Burnt Pine estate has created an authentic, organic experience that embraces material & detail, form & function, technology & tradition. 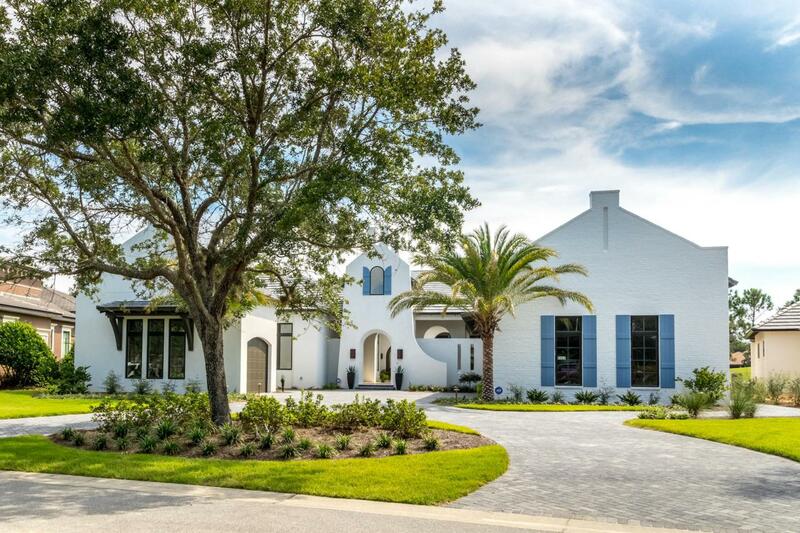 Set in a lush and serene location, fronting the 7th and 8th holes of the Raven Golf Course, this ultra-luxurious home epitomizes design-forward living. A dramatic courtyard entrance, flanked by arched-entry walkways and a private outdoor sitting area with fireplace and water features invite you into this exquisite home. Once inside, you are immersed in the rustic-meets-west coast feel of this home. Built with entertaining in mind, the open floorplan flows freely from room to room, starting in the grandliving area. This area features many unique elements, such as solid walnut beams highlighting the soaring 14' ceilings, a glass mosaic tiled wine bar with refrigerator, Sub Zero ice maker and built-in display cabinets, and a warm and inviting fireplace. Triple 10' sliding glass doors open into the covered lanai and outdoor kitchen to create a seamless indoor/outdoor living space. The "heart of the home", the kitchen, is a masterpiece in itself. The massive solid-slab marble island offers family and guests ample room to congregate over food, drinks and conversation, and easily seats six. Complete with built in Thermador sub-zero single panel refrigerator and freezer, and 60" chef-sized gas stove, a room-sized hidden walk-in pantry and palatial lighting fixtures, this room is every gourmet and gourmands dream come true. A tranquil view of the stunning pool and lush greens of the Raven Golf Course from nearly every angle only adds to the ambiance of this space. One of the (many) unique features of this home is the availability of personal living space. In a private wing of the house, you will find two bedrooms, both with full baths and a mother-in-law suite with living room, bedroom and bath, all with private access to the courtyard entrance. The oversized master suite is beyond description with vaulted ceilings that continue with the walnut beams, walls of glass and doors overlooking the golf course and opening to the pool and lanai, glorious walk-in shower, soaking tub, double marble-topped vanities and extensive custom closet. Off of the master is a wonderful flex space that could be used as studio, gym, or home office. Step though one of the many glass doors out to the lanai and you will find a beautifully designed pool with striking fountains, an infinity edge spa, and beautifully landscaped entertaining space replete with a private pool bath and full outdoor kitchen, all overlooking the golf course. Perfect for enjoying a quiet evening watching the sunset, a glass of wine with friends or a relaxing swim under the stars. Other features of this estate include split garages with space for 3 cars, plus a separate golf cart bay with its own entrance, a circular drive, ambient landscape lighting, an outdoor shower and indoor/outdoor Sonos wireless speaker system. Furniture may be purchased separately. For a full list of custom features, please call agent. As an introduction to the Sandestin lifestyle, we invite our new owners to explore amenities that make Sandestin special. The listing brokerage and seller(s) are presenting the buyer(s) of this property with (2) 90-minute rounds of Tennis court time, a golf foursome at one of our three championship courses, a round of golf for up to four (4) players and an invitation to "Club Night" at the unrivaled Burnt Pine Golf Club. Sandestin Golf and Beach Resort is a major destination for all seasons and all ages, and has been named the #1 resort on Florida's Emerald Coast. This magical resort spanning over 2,000 acres is comprised of over 70 unique neighborhoods of condominiums, villas, town homes, and estates. The resort features miles of sandy white beaches and pristine bay front, four championship golf courses, a world-class tennis center with 15 courts, 4 resort swimming pools (and 15 private neighborhood pools), a 113-slip marina, a fully equipped and professionally staffed fitness center and spa, meeting spaces and The Village of Baytowne Wharf, a charming pedestrian village with events, shopping, dining, family entertainment and nightlife. For true golf cart community living, Grand Boulevard is just outside the resort gates and provides access to additional shopping, dining and entertainment " all without traveling on Hwy. 98. Come to Play, Stay for Life!